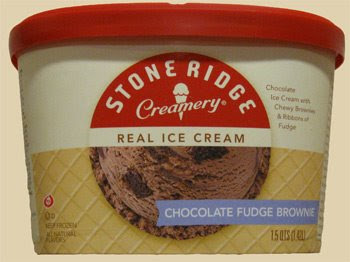 That's right, the other brownie flavor that got my attention Monday night was Stone Ridge Creamery Chocolate Fudge Brownie "Real Ice Cream". 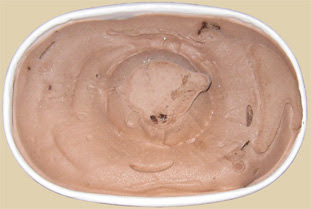 Something tell me that's a shot across the bow of all the "Frozen Dairy Desserts" out there ...ya got that Edy's? It was kind of funny because only two of the flavors were sporting the new look. It actually took me a minute to decide between this and the other one. They both were a chocolate base with a fudge swirl, but the other had almonds. Took a minute, but I went with the brownie. Ok, I know it doesn't physically affect the taste, but opening the container to see this totally threw my mental taste buds off. I'm just not quite sure what to make of it, it kind of looks like a frozen frosty or something. Plus, I only spy two brownie bits to start off with. No matter, it's the taste that counts, and at the moment, I'm probably setting the bar a little too high before I dig in. First Scoops: wow, these brownie bits are chewy, a total contrast from the Brigham's ones yesterday. At least the texture is better, but it still feels a bit off. The taste of the chocolate is decent once you settle into it, but something just doesn't feel right, almost like it's been refrozen. I know it's been a long time, but you know what? it totally reminds me of Edy's Loaded Chocolate Fudge Brownie ...wow, it even has the same name. I wish I had some to do a side by side comparison because it's going to bother me now. Verdict: it's alright. Ya know, it's decent quality for an entry level brand, but like the other flavors, I'm not real impressed. It went down easy enough, but I was already getting bored looking for more brownie bites. Actually, I guess I was looking for more brownie flavor, and not so much the chewy bites I was confronted with. It is made by Kemps, but the formulas are definitely not the same as Kemps. The brand is the private label of SUPERVALU, which owns Shaws, Cub, ACME, Alberstons, Jewel Supermarkets etc...There are a total of 40 flavors. I bought the blueberry cobbler ice cream and love it. I want to try other flavors now and the price is great too. I am sorry I tried this ice cream cause now I am addicted to it! Tastes like real ice cream should. Love all the flavors.